The ABC’s of vinyl siding installation | Greg Martineau Projects Inc.
For a re-siding job over existing wood siding, nail down loose boards and replace any rotten or damaged ones. Check all walls for evenness and install furring strips where necessary, making sure to establish a smooth, continuous surface. Remove loose caulking and re-caulk around windows, doors and other areas first to ensure a watertight seal. This is also a good time to add insulation, bringing up the R-value and levelling the walls. Waterproofing measures are important for your siding’s longevity and performance. Vinyl siding is designed as an exterior cladding, not a water-resistive barrier. Because vinyl siding is designed to allow the material underneath to breathe, it is not a watertight covering. The first step to proper installation is to use a house wrap, such as Tyvek. The house wrap keeps the water out while allowing moisture from the inside to escape. Not only does the house wrap reduce or eliminate leaks, it also limits drafts, helping to reduce heating costs. Before the siding goes on, new drip flashing should be put above all the windows. In many retrofits, the old drip flash has a few layers of paint on it or is dented. This should be changed out to make the final job look complete. The new drip flashing must be sealed to the exterior sheathing and to the top of the window. Also, if you are thinking of changing out any windows or doors, do it before you put the vinyl siding on. This duplicates a new construction process to make a sealed exterior envelope. In re-siding jobs, everything should appear to be level or plumb. Because siding is often installed level on an un-level structure, the siding appears to be slanted, even if it was sided as level. Aesthetically, it is better to hang the siding plumb with the structure. Although the level may indicate it is off, it will look level to the eye. When a vinyl siding job is installed properly you should be able to move each corner post up and down and each horizontal piece sideways. 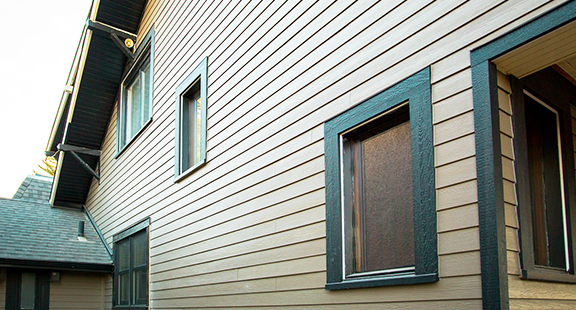 All vinyl siding and accessories are designed with elongated slots to accommodate movement. The product can expand and contract up to ½ an inch in extreme summer and winter temperatures. Overlaps on siding should face away from a driveway or front entryway to avoid showing seams. Joints should be randomly placed so that they are not obvious. Surprisingly, these aesthetic aspects are often noticed too late.